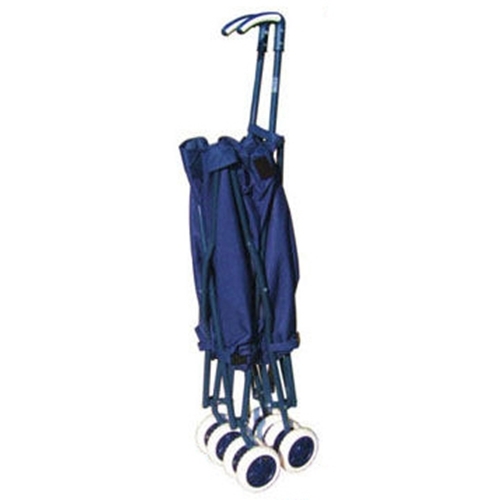 VersaCart Folding Utility Transit Cart from HealthyKin.com easily carries 120 lb of cargo and then some, yet folds up in a snap for compact storage in your trunk or closet. Use it for grocery, mall shopping, laundry, picnics, camping and so much more. The extra large detachable heavy-duty nylon canvas bag measures 21"H x 17"W x 18"D for a generous 3.72 cu ft capacity. The bag has handles, a fitted cover and is coated for water-resistance. Features thick ergonomic easy-grip handles and double wheels all around for maneuverability and stability. No assembly tools required. 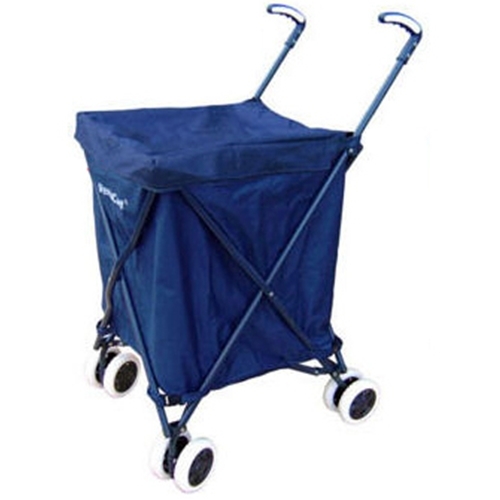 Simply pop in the swiveling front wheels and you're ready to roll! The VersaCart is lightweight at only 9 lb. Handle height (when open) approximately 37"
This is my second cart I paid a lot more for it the first time somewhere else. I used this cart so much when I had to move into an Apt. This cart is a work horse for sure. I didn't need a new on yet but a friend wanted it and couldn't afford a new one. 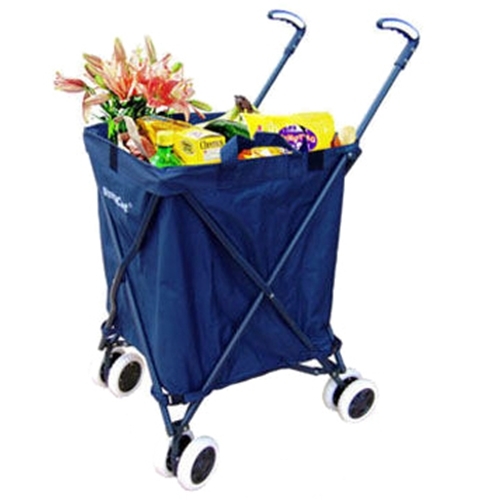 I just love,Love this cart. I put 5 gallons of water plus my groceries in it at one time. I have a very long walk from my car to my apt. So this cart is my right arm. I can't say enough about this cart. A few people liked mine and bought their own. I am 69 so it works well for me. People can't get over how much I can pack in it. Love your low price. I paid $ 20.00 more for it the first time. Excellent product. This is my second one, having worn out the first (wheels wobbly) and there are some improvements over the first, such as a more effective way to keep it tied closed (the is strap better than the plastic clip). I walk with it to shops, or take it in the car to unload, and cart things from parking lot to condo. Easy to store. This is definitely a big 5! It's fabulous for my needs. I am disabled and this cart is so light weight I can even carry it to the car(empty) while using my walker. When I come home with groceries, I use it without the walker and it works wonderfully. I bought it at full price and it was still worth every penny! It's way better than the carts u usually see poeple with. I had one of those and It broke in a week. I also love how it folds in making it easy to store in my small apt. Only thing I wish was that the wheels were a bit bigger to more easily handle all the uneven side walks around here. This is my second cart in seven years. Live in a downtown high rise. Couldn't live without it! Excellent product-essential for any long walks from your car to the apartment! excellent quality for the price! This is my second cart in 7 years. Love it. Thank you for the quick delivery. I can't really rate the cart because I bought it for my mother. I can say I know she does not use the cart because she finds it to large and cumbersome. Will find her something smaller and lighter.